Beautiful bronze refridgerated wine door with a dimensional center piece accented with 4 feature shapes adding a visual "pop". .. This masterpiece refridgerated double wine door with side lights is exquisite with intricate vines woven with grape leaves and clusters. .. 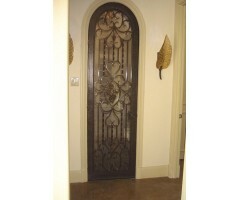 This refridgerated wine door is perfectly proportioned and pleasing to the eye in every way. .. 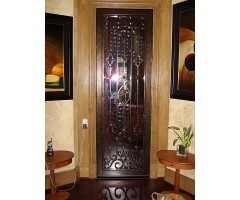 Double refridgerated wine doors make a huge statement in their full detail design. .. 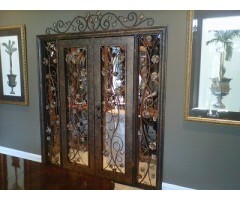 Double refridgerated wine doors framed with mid size scrolls and completed with twisted bar accented by square collars. ..